When Ben and Mike started Mercuna, it was on the back of careers working together on space games. We still consider this genre to be Mercuna’s natural home because our technology can solve something which plagues so many space games: making it fun. Open space gives so many possibilities to game developers, but there is always a risk that it becomes featureless. 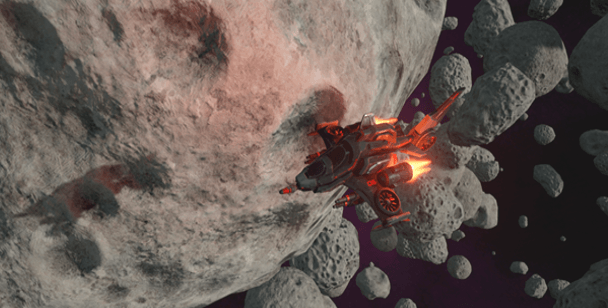 We want you to explore all the possibilities of space, not just the 6 degrees of freedom, but allow your AI to fly in and around space stations, have dogfighting close to asteroids and have AI chase characters down twisty space mines. These activities seem quite simple, but require very powerful navigation middleware. Mercuna flies AI close to asteroids and through doors in space stations because it uses a spare octree which can map topography in fine detail. Building a simple octree would slow the whole game up, so we have used hierarchical pathfinding on multiple threads, plus a whole host of other memory-saving innovations, to make using Mercuna quick and simple. Good space flight is also about more than 3d pathfinding. We have smoothed paths so that flight looks more realistic and less jerky and have included steering and movement modules using Newtonion physics so that players get to experience real space flight. We have also worked really hard on our avoidance modules so that AI can fly around in the middle of an asteroid belt without crashing into each other, or into adjacent asteroids.